Anna Paolucci | Anna & the Consequences… because there always are! Anna Paolucci was born and raised in the Rubber City of Akron, Ohio. Her grandfather was a symphonic trombonist with the famed CBS Orchestra in New York City and her father is known as a jazzer. 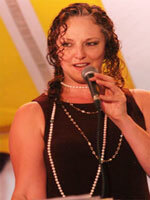 She moved to Columbus in 1987 where she quickly founded the tongue in cheek a-cappella group Throat Culture. She has been involved in theater and performing since the age of 8 and has continued by and booking, singing, writing, arranging, recording and producing since calling Columbus home. She was a producer of The Gift music recordings in 1997 and the Executive Producer of the 1999 release, both featuring all local musicians. 100% of the proceeds (in excess of $20,000) benefited Columbus Coalition for the Homeless Foundation. Be it a loyal Community Festival contributor, opening for Koko Taylor and now slinking her way into our hearts with the sultry sounds of the Consequences; her charm, cabaret performance style, and ability to deliver great blues with a bang, win over crowds intimate or otherwise.